marked “Win it!” for the mandatory entry and optional bonus entries. Glamourmom is offering our readers a giveaway of a nursing tank, a value of $49. Glamourmom tanks are fabulous nursing tanks that provide the support of a built in bra, along with a tank top to cover your tummy! After you’ve entered this giveaway, be sure to check out the giveaway of a Glamourmom Nursing Bra Long Tank over at Code Name: Mama and NursingFreedom.org! I’ve always been a firm believer in the idea that you don’t need much gear to have a successful breastfeeding relationship. You need a mom, and a baby, and perhaps a few sleepers and some diapers. 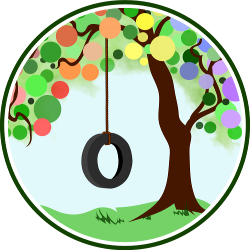 You need perseverance, patience, support from family and friends, and the phone number of a skilled International Board Certified Lactation Consultant or a La Leche League Leader if you run into trouble. That being said, there are some great products out there that can make breastfeeding easier and that can help a new mom feel good about herself! One of those great products is a Glamourmom Nursing Tank. Glamourmom was started in 2000 after its founder, Line Rothman, gave birth to her daughter. She was looking for something that would provide support and easy access to her breasts, while at the same time covering her postpartum tummy. So she designed a nursing tank with a supportive bra. This was something that did not exist at the time! I feel very lucky that I have been given a Glamourmom nursing tank to review. Ever since it arrived in the mail a couple weeks ago, I have been wearing my Glamourmom Nursing Bra Full Bust Long Top around the clock! This nursing tank has lots of fantastic features! It contains a full, built-in nursing bra with an adjustable band and adjustable straps. It provides extra support in the bust area as compared to Glamourmom’s other tanks and tops. It is cut long – the website states that it reaches to mid thigh. I have a long torso and found that it just covers my bum. It is made from thick, stretchy fabric – 92% cotton and 8% elastane. I have been wearing this tank non-stop! I’ve worn it to sleep and I’ve worn it during the day. The built in bra provides good support for daily activities, although I wouldn’t recommend it for high impact exercise, such as running. It is comfortable enough to wear at night – I personally undid the clasps at the back of the band at night for extra comfort. Here are some of the things I liked and disliked about the product. I love that the built in bra provides support for us moms with a bit more on top! The full-support bra, the adjustable band, and the thick straps all make for a very comfortable and supportive product. The nursing clips are very easy to open and close with one hand. The neckline of the product is just perfect – high enough to not show cleavage, low enough to be flattering. The adjustable band is a unique and very useful and practical feature of this tank. Most moms will find that their band will change dramatically during the first few months postpartum. I love that each mom can customize her own fit with the band as her body changes, so that she will always experience support and comfort. The fabric of this product is just right. It is thick, stretchy, and it hugs the body without being clingy. This means that it would stretch nicely and provide support and coverage to a postpartum tummy, but would not be too loose once that tummy starts to disappear. I also love the choice of colors. Basic black or white would be a great staple in any wardrobe, but there are also some fun and flattering colors, like the Grape Galore that I tried. I found this inner layer to be a bit itchy, although I did get used to it and it felt less itchy after washing it a few times. 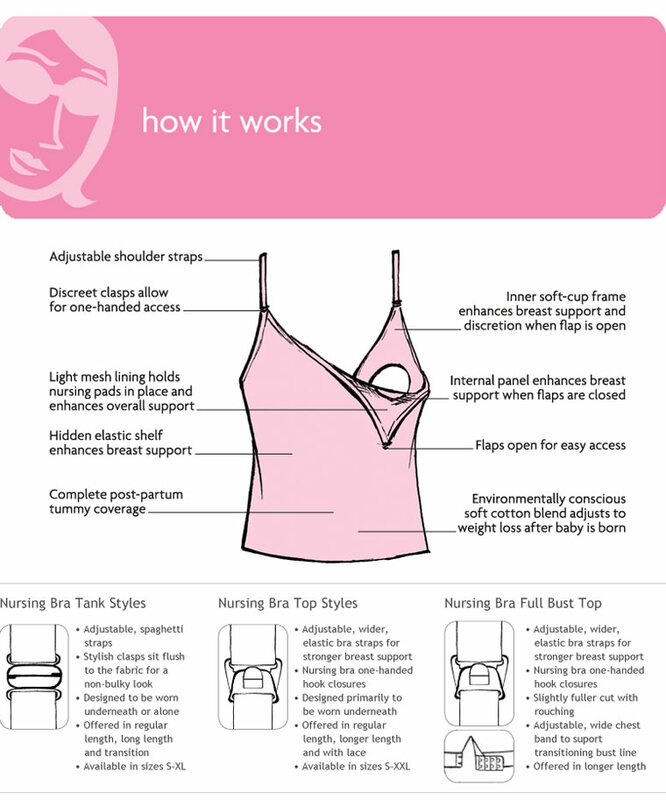 It does provide some extra coverage on the top of the breast when nursing, so perhaps some moms might like this feature. All in all, I would say that this is a great product. I’ve tried a few other nursing tanks, and this one is the best I’ve found. The supportive bra, the adjustable band, the long length, and the thick fabric make it hard to beat! I’d recommend this tank to any mom looking for a comfortable yet supportive nursing tank. Layer another shirt on top, and you can very easily nurse in public! Lift the top layer up, lower the bra and feed your baby, without showing any tummy or breast. The stretchy fabric and adjustable band means that this tank will easily take you from early postpartum days far into your breastfeeding relationship. Yes, you could wear a nursing bra, with a regular tank over it, and another shirt on top. Yes, you could just undo your bra and pull your regular tank down underneath the breast, and pull your top shirt over the breast. I do this all the time, and it works, although my shirts tend to get stretched out and wrinkled. The process becomes easier using a Glamourmom Nursing Tank, and a nursing tank can certainly help a mom feel more confident nursing in public, especially in the early days. 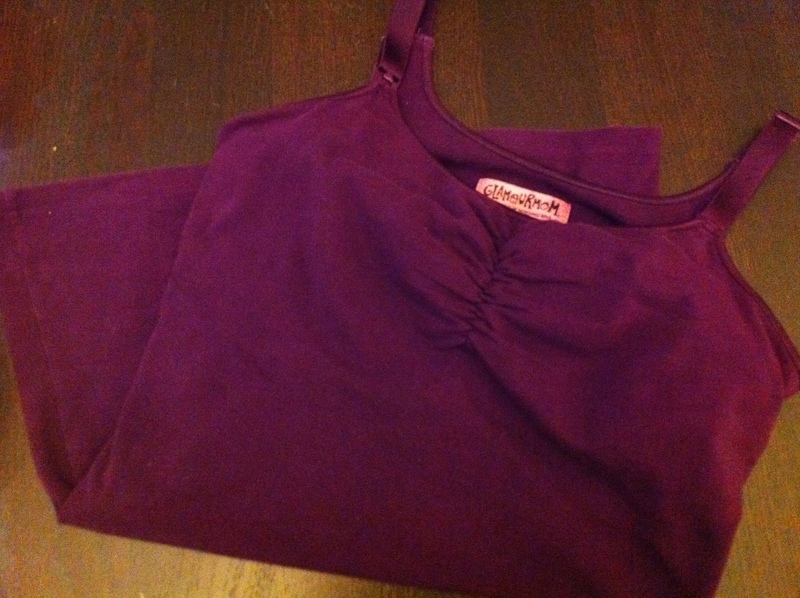 Be sure to check out some of Glamourmom’s other products – their bras, pajamas, and other nursing tanks all look fabulous . . . and even a little bit GLAMOROUS! You can get the Nursing Bra Full Bust Long Top and more by ordering directly from Glamourmom’s website. Amazon also carries several Glamourmom products. Glamourmom does offer free shipping on orders over $50. For your own chance to win a Nursing Bra Full Bust Long Top from Glamourmom, enter by leaving a comment and using our new Rafflecopter system below. One winner will receive a Nursing Bra Full Bust Long Top. Contest is open to United States residents only. MANDATORY ENTRY: Tell us what you would buy at Glamourmom! You must enter your name and email address in the Rafflecopter entry system for your entry to count, after leaving a comment on this blog post. This is a joint giveaway with Little Snowflakes and Natural Parents Network. You may enter at one site only, and we’ll be recording IP addresses to ensure that there are no duplicate entries. That said, please do visit and enjoy all three sites! Contest closes April 18, 2012 at 12:01 a.m. Eastern Time. I love these form fitting tanks. My mom recently sent me some older nursing tops…they look like potato sacks with holes cut in the front and they don’t fit. There’s nothing wrong with them, but would you rather be comfortable in a tank or feel like you’re wearing a potato sack? I would get the tank in lavender frost! I put the color I’d choose in my first comment, but I also love the nursing bra long tank in strawbery! I learned there is a flat rate $7 shipping charge no matter how much you buy…definitley a plus to buy more! I would buy the Mpress™ Lace Microfiber Nursing Bra – looks super-comfy! The color I would choose is the all-purpose black. The tanks have a full-support (!) built-in bra. Since I just gave birth to our 3rd little one on March 12th I would LOVE one of these tanks in any color!!! Any nursing tank that I have ever tried have not worked for me because of my larger bust size. I always have to wear a nursing bra under them, which defeats the purpose!! I would love this tank in any color, but white or black would be the best to start with since they would go with everything. I learned that they have many different styles of tanks instead of just the main basic one. tank in black, so slimming! awesome company, love their stuff! I would buy the Nursing Bra Long Tank in Chocolate. I would buy it in Chocolate. The nursing bra nightgown. It’s hard to find good nursing stuff for nighttime.